Just in case those of you reading don’t understand my mathematical logic I’ll put it into a different format…. Now, most of you may wonder what the heck I was doing before spending the afternoon in the sun…well, I was far too worried about my ducklings getting burned than I was about making sure I didn’t. 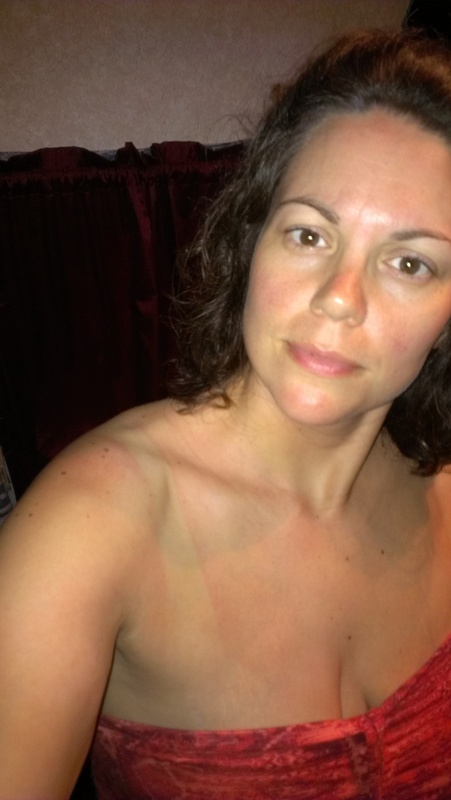 And I know this doesn’t look terrible…but I knew if I didn’t DO something, I would be forced to cover up my tight, angry, peeling skin for the rest of the week we were at the beach…and that just wasn’t acceptable. So, I delved into the limitless resources available to me on the world wide web and came up with a game plan. I read various home remedies and settled on the one that allowed me NOT to have to go to the store. Tea bags. Yep. You read that right. Tea bags. The only kind I had here in the camper were some children’s organic grape sleepytime tea. The article said to use black tea but I figured what the heck…tea is tea right? Basically all I had to do was make a VERY strong tea, let it cool to room temperature, and then pat it on my burned skin a few times. From my readings, I learned that there are quite a few very beneficial chemical compounds in tea. The tannic acid and theobromine aid in removing the heat, which helps prevent the swelling, and the catechins are helpful in preventing and repairing skin damage….so even if this didn’t work, I knew at least it couldn’t hurt. So, I sat on the floor with my mixing bowl full of tepid tea bags, with a towel around my top so I wouldn’t stain my clothes and proceeded to dip and pat said tea bags over my shoulders while we watched a movie. After about two hours of dipping and dabbing, I smelled like a grape! I didn’t rinse it off and then hit the sheets…..and this is what I looked like the next day…. Not too shabby, eh? I think it worked quite well and will definitely keep this tactic in my arsenal of home remedies. Now, there’s no better way to get rid of a sunburn than to just be smart and use sunscreen! But if you get preoccupied like I did and just completely forget to take care of numero uno then at least you know there’s an option for a quick fix. I was pretty happy with the results. I didn’t peel a bit. 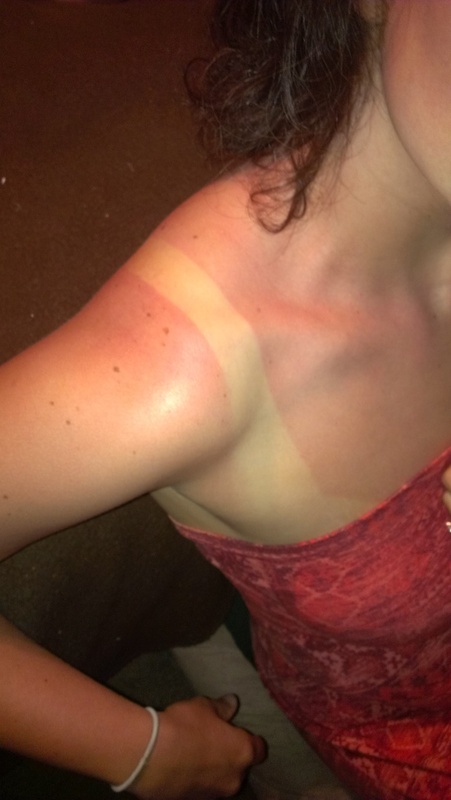 And at two days out you couldn’t even tell I had gotten a burn! Here is a page I found that has some more great home remedy options in case you’re interested! That’s awesome! I’m definitely logging that one away in case anybody gets a sunburn this summer! Thank you for sharing! PS: You are looking *amazzzzzing*, as always! Enter your email address to follow our blog and receive notifications of new posts...you don't want to miss any! Notice-You can't use anything from our blog without our written permission. You can link and use excerpts as long as you give Travelling Awesomes due credit.